… a pumpkin is really a squash? It is! It’s a member of the Cucurbita family which includes squash and cucumbers. … that the Irish brought this tradition of pumpkin carving to America? The tradition originally started with the carving of turnips. When the Irish immigrated to the U.S., they found pumpkins to be plentiful and they were much easier to carve for their ancient holiday. … that pumpkins are grown all over the world? Six of the seven continents can grow pumpkins, including Alaska. Antarctica is the only continent that they won’t grow in. I am no expert in Italian cuisine. I started making one by one for my daughters. My older one loves italian food. I used to buy canned pasta sauce as I dint know how to make. I did see they have food colors. Even all natural sauce stained plastic box with orange color. Then I started making my own sauces. This is one of them. I used best out of fall season pumpkins to make sauce. This sauce stays fresh in refrigerator for 2 weeks. 2 cups - roma tomatoes. Boil water in a pot. Turn off heat. Wash and place tomatoes in water for few seconds. I place for 40-60 seconds until at-least one tomato skin slits. Remove from water. Peel skin. Save water for future use. Peel pumpkin skin. Cut into cubes. In another pot, add 1 tbsp oil. Heat to medium. Add onion, garlic. Fry for 2 mins. Stir. 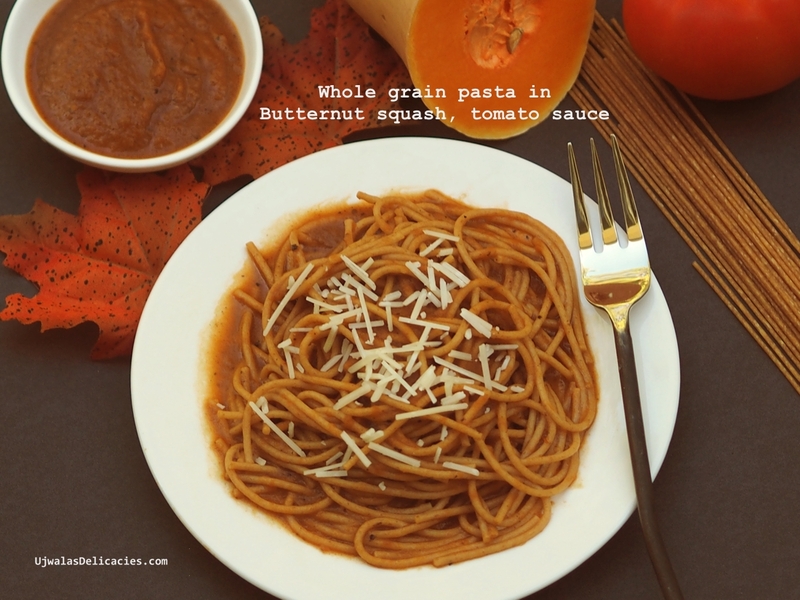 Add peeled and diced pumpkin, tomatoes and fresh basil. Cook for 15 mins stirring every 5 minutes. Watch TV in the mean time. After 15 mins add salt and oregano. Cook another 60 minutes. Stir every 5 minutes. Add water if sauce becomes thick. If sauce is watery, cook till water evaporates. Turn off heat. Pour remaining 1 tbsp olive oil on top. Blend this in a blender or with hand blender. You can store this sauce in refrigerator for 2 weeks. After cooking, discard remaining water. Make sure to leave a little water. Extra starchy water keeps pasta moist. Add sauce to pasta. Stir thoroughly. Sprinkle your favorite cheese. I used organic parmesan cheese. You can use mozzarella, goat, gorgonzola or blue cheese. To make it vegan, skip cheese. Use gluten-free pasta to make it gluten free. You can make it oil free. Instead of using oil to fry onion, pour a little water and cook. Follow same procedure for remaining.